How do you trust someone who lies for a living? Don’t all writers lie to some degree or another? 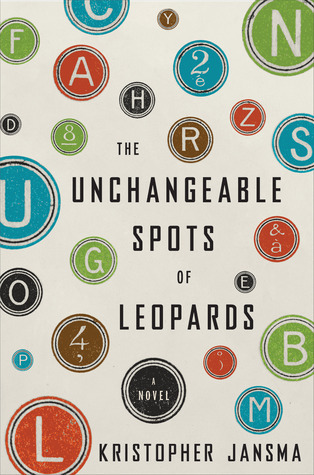 In Kristopher Jansma’s debut novel The Unchangeable Spots of Leopards, we follow one man’s quest to become a writer, but his is a story told through a bunch of short stories with one very unreliable narrator. We never learn what the narrator’s real name is, but there are two things we know for sure: he has lost every novel he has ever written and he follows Emily Dickens famous advice to the letter, ‘tell all the truth but tell it slant’. In the first short story the narrator is a teenager whose brief meeting with a well-to-do debutant inspires him to per-sue his dream of being a writer. The debutant asks the narrator to ‘write something for her’ and so he does and that leads to more writing and next thing we know he is in college where he meets two equally eccentric writers: a young woman he dates for a while and then the ubber talented Julian McGann. Julian and the narrator are like two peas in a pod. They are both very talented writers and both inspire both competition and respect in each other. It becomes clear that Julian will be a huge success and the narrator will forever be haunted by his successes. While in college, Julian introduces the narrator to his childhood friend, Evelyn who also happens to tell lies for a living….she is an actress. The narrator and Evelyn take up an on again off again relationship over the course of the book. He clearly loves the idea of her but there is something about her he doesn’t quite trust. He is bothered that he never really knows who she is. When he sees her in her room before her wedding day putting on her makeup he finds himself wondering, what is she thinking? Who is she? This is a question he spends most of the book trying to figure out….who is this women he is in love with, is he really in love with her or just the idea of her? As the story comes to a cross roads, the narrator desperately wants to tell the truth but he has told so many lies that he doubts he even knows what the ‘truth’ really is anymore. Throughout the book we read a collection of stories about the things the narrator has lost and the things he has found and we decide what is truth and what is lie and if it in fact really matters or not. I absolutely loved this book! That said, it took me a while to review it as it’s one of those books that needs digesting. What I really liked about it was that it made the reader see the story and message differently. Often times as a reader we focus so much on who the main character/narrator is and the sequence of ‘factual’ events within the plot. By using this nontraditional form of storytelling and narrative unreliability it makes the reader focus more on the message and threads of ‘truth’ within the lies and how the reader felt while reading it…..it’s a very fresh, postmodern approach to storytelling and one that I completely fell in love with. I loved the way the story made me feel, it’s hard to describe how I felt while reading it but I can safely say that it was a very thought provoking read and one that will stay with me for a long time. This is one of those books that I will come back to again and again and each time I read it I will gain some new insight and perspective into the characters and myself as a reader. It was obvious that Jansma wanted to play around with this idea of truth. It seems like the narrator truly enjoys lying his way around the world and trying on all these new fabricated identities, and honestly who hasn’t dreamed of doing precisely that? I know I do on a daily basis! The result is infectious and fuels the story! On the flip side, I never really felt like I connected to the characters because so much of the focus was on the plot and the quest for ‘truth’. I didn’t necessarily mind this but it was different for me as a reader because I love character driven novels personally. The book is split into two different parts and the transition in the middle is a little rough which for me was the biggest issue with the novel. I liked how the first half ended and how the second half began but there was no real transition, I felt like there needed to be a little more of a buffer for the reader as I was a little lost. In some ways I felt like the first short story with the debutant was a little unnecessary, I didn’t really see that it was relevant to the overall story except as simply an introduction to who the narrator ‘was’. This was a really difficult book for me to review because it is really something that should be experienced. It is an innovative, intelligent, humorous, unique read and each reader will take away something different. If you are looking for a book that will take everything you know about postmodern lit and turn it on its head, than this is the book for you! A haunting novel that will make you question everything you think you know as truth. How can it be awful of its expected. I’d come looking for someone I’d made up a long time ago and that as fun as it might have been to break character for another night, I owed her more than that-much more. I have this on my TBR pile, but haven’t read it yet–I’ll come back, read this in more detail, and let you know what I thought after I read the book! This sounds like a great book. The storyline reminds me of the description of The Thirteenth Tale, which I haven’t read yet, but now both are on my list!